Maundy is the Old English word for command. On the Thursday when Jesus was arrested before His crucifixion on Good Friday, Jesus gave His Church a new command: that we love our fellow disciples with the same commitment, passion, and sacrifice that He lived out in His suffering and crucifixion. Of the four gospel writers, only John mentions this commandment. But John doesn’t mention what, for the other three--Matthew, Mark, and Luke--is central to this night, the institution of Holy Communion. Are the evangelists--three on one side, one on the other--contradicting one another? Not at all! John’s entire account of Jesus’ earthly ministry is framed by a consciousness of the centrality of the two sacraments, Holy Baptism and Holy Communion, to the Christian life. And so, John tells us that Jesus’ ministry begins at Cana when He turns water into wine and His ministry ends when, dead on the cross, a Roman soldier pierces His side and sees water and blood emerge from the wound. The Christian life is composed of receiving new life as an act of grace through Jesus at our baptisms and continuing to receive new life and the forgiveness of our sins as Jesus gives Himself again in Holy Communion. John doesn’t denigrate Holy Communion; he elevates it. Similarly, Matthew, Mark, and Luke, by their accounts of Jesus’ institution of Holy Communion don’t denigrate or ignore Jesus’ new commandment. On the contrary, when we receive the body and blood of Jesus in Holy Communion, we are immersed again in the saving love of Jesus. In, with, and under the bread and the wine, the body and blood of Jesus enter us, and as we receive Him by faith, He imparts the power to love our fellow disciples as He loves us. So, there is no contradiction among the four gospels about Maundy Thursday, just different perspectives, each reinforcing and underscoring the other. The gospel of Luke’s account of the first Maundy Thursday and the institution of Holy Communion is our focus tonight. I want to look at just the last seven verses of the lesson, Luke 22:14-20. The feast of Unleavened Bread was kicked off by Passover, the annual celebration of God’s ancient people, the Jews, of God’s deliverance of their ancestors from slavery in Egypt. On the first Passover, the eldest of captive Israel’s children and livestock were spared when the angel of death sent by God passed over because their families smeared the blood of a lamb without blemish on their doorposts. On the first Maundy Thursday, Jesus is showing us that He is about to accomplish something even more miraculous and spectacular: The power of sin and death will pass over and not harm those washed clean of the blemish of sin in Holy Baptism and who are covered in the power of His life-giving blood when they trustingly receive Holy Communion. This is what Jesus anticipates as He sits with His disciples at this last Passover. Those of you who were able to attend the Jews for Jesus presentation on Christ in the Passover, will recall that four cups are part of the Passover meal or Seder. The Seder celebrates God’s old covenant or old testament with Israel. Scholars are unclear as to which of the four Passover cups Jesus is sharing in verses 17 and 18. In the end, I don’t think it matters much. The more important thing is that from this old meal commemorating the old covenant, Jesus institutes a new covenant by which all people, Jews and Gentiles, may be saved from death for all eternity. In Jesus, Israel’s historic mission of being God’s light of salvation and new life to the nations if fulfilled. A new or renewed Israel comes into being, believing Gentiles grafted into one body with believing Jews. Because God has now shown up in our world in Jesus--the Word made flesh--all people are called to trust in Jesus for life with God. As the apostle Peter said of the risen Jesus: “Salvation is found in no one else, for there is no other name under heaven given to mankind by which we must be saved.” (Acts 4:12) In a sense, the cup that Jesus shares with the disciples before instituting Holy Communion is the last act of the old covenant. A good rule of thumb when interpreting Scripture is that, unless symbolic or poetic imagery is intended, the Word says precisely what it seems to be saying. That’s true of Jesus’ words here, the words of institution. Jesus does not say, as He shares the bread, “This represents my body” or “This symbolizes my body.” Instead, Jesus makes a simple, declarative sentence, “This is my body.” The same happens with the wine: “This cup is the new covenant in my blood…” As I’ve said before, Jesus knows precisely what the meaning of is is. Through the power of His Word spoken over the elements, the bread and the wine are also His body and His blood. Jesus gives Himself to us! The simple elements of the two sacraments--water, bread, wine--are God’s saving Word, the good news of new life for all who turn from sin and trust in Jesus, touching our bodies, our tongues, our bloodstreams, just as surely as the read Word enters us through our eyes and the proclaimed Word enters us through our ears. Holy Communion is Christ entering into us, destroying the cancer of sin and raising us up to life with Him! This means too that when Jesus says that we’re to receive His body “in remembrance” of Him, it doesn’t mean that receiving Holy Communion is a tour through musty history. Jesus means that when we receive this sacrament with faith that He always tells us the truth, we are re-membered to Him and to His people, reconnected to Christ and the eternal Church of every time and every place, on earth and in heaven. We feast with Abraham as he received the bread and wine from Melchizedek. We feast with departed loved ones who, heaving trusted in Christ, today enjoy the messianic banquet with Jesus in eternity. We feast with every believer in the world, from Amir, the Iranian I met and talked with for forty-five minutes at Aldi’s the other day, who left Islam and came to faith in Jesus back in 2005, to Miriam, Daniel, and Francoise, Jews who trust in Jesus for their salvation, who we met last week. We feast with the members of the black churches in Alabama that were recently destroyed by a racist arsonist. We are re-membered to Christ and to each other and eternity invades are sin-darkened, time-bound world. Holy Communion is a miracle wrought by Jesus by which He lets us have and savor a foretaste of the feast that He has in store for all His people. In Holy Communion, heaven comes to earth. When I was a boy, my parents liked to start our vacations at night based on the mistaken idea that we five kids would fall asleep on the way and dad could drive in peace. That never happened, of course. We always had a big meal before we left home and, since there were no snacks in the car, would only eat when we stopped along the way for a meal. I guess you could say that, through those pre-vacation meals, we were fortified for the journey. For the baptized believer in Jesus, life on this earth is a journey. First Peter tells us that we’re foreigners in a strange land. But along the way, God fortifies us with the living bread from heaven, Jesus. Tonight, we enter a different journey, one that Christians have historically called the Easter Triduum, the Three Days--Maundy Thursday, Good Friday, Easter Sunday. It’s a journey through Christ’s betrayal, His death and burial, and finally His resurrection. For the first disciples, the time between Jesus’ death and resurrection was a long, grief-filled journey, the way our lives in this world can sometimes be. Their lives weren't perfect or easy even after they came to know that Jesus is risen from the dead. So, how powerfully loving it was of Jesus to fortify those first disciples for all of their journeys and to fortify us for our own journeys through our own Good Fridays until we reach the believer's final destination, that Easter when we will one day, beyond the gates of death, awaken in His presence. Jesus does that by giving us not just a memory, but Himself, His body and blood in this sacrament, bread and life for our journey. Yesterday's Palm Sunday message from Living Water Lutheran Church: HERE. In many churches, in recognition of the fact that many Christians don’t attend Maundy Thursday and Good Friday services, this day is designated not as Palm Sunday but as The Sunday of the Passion, a Sunday that remembers Christ’s suffering and death for us. I prefer to give Palm Sunday its due as a separate day with its own significance. Besides, if you’re interested in remembering Christ’s passion--His suffering and death--there is a whiff of His crucifixion and death amid the celebrations of Palm Sunday. 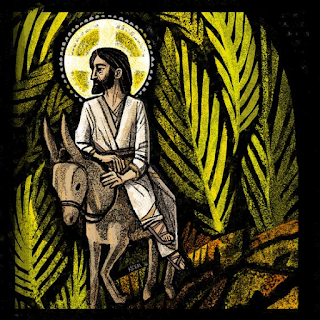 Palm Sunday isn’t all sweetness and light. Don't let the crowds who shouted in adulation fool you about that! Ultimately, it would be neither Jewish leaders nor crowds nor the Romans who would take Jesus’ life. In Luke 23:46, we’re told “Jesus called out with a loud voice, ‘Father, into your hands I commit my spirit.’ When he had said this, he breathed his last.” Jesus died at precisely the moment when God had decided He would die. The leaders didn’t know it, but they were doing the will of God against their wills. In our lives, we often think that we’re in control. But, whether we perceive it or not, God is still in charge. We may endure tragedies and heartbreaks, as the folks down South whose lives were upended by tornadoes yesterday, but God is bound to ultimately bring His good out of bad. God will use Good Fridays to bring Easters for those who place their hope in Him alone! In fact, in The Small Catechism, Martin Luther shows us that Good Fridays and Easters are the prevailing pattern of the disciple's life. The life of daily repentance and renewal it commends is nothing other than the daily crucifixion of self so that Christ can give us the forgiveness that brings new life in Him. Good Friday and Easter loom in the background as Jesus and His disciples enter Jerusalem at the beginning of our gospel lesson. Please go to it, John 12:12-19. The words and the palm branches used to welcome Jesus help us to understand that while the people see Jesus as a king, they want Him to be an earthly king who uses military might to save them from the oppression of the Romans. Among God's people, palm branches were associated with the welcome given to military conquerors. Jesus is the King--the Messiah, Lord of heaven and earth. But He doesn’t conquer by force of arms, by mob rule, or by using a democratic vote. Jesus’ authority isn’t derived “from the consent of the governed.” As Jesus told the Roman governor Pilate after He was arrested: “My kingdom is not of this world. If it were, my servants would fight to prevent my arrest by the Jewish leaders. But now my kingdom is from another place.” Instead He conquers by a servant love that dies for us. And the enemies He conquers are the common enemies that live in every human soul: sin, death, darkness. Jesus won’t be our king on our terms. We can’t come to Jesus and say, as some people do, “Jesus, I’ll follow You if You do so and so.” Jesus becomes our Lord only when we entrust ourselves to Him, allowing Him to crucify our sinful selves so that our new selves, remade in Christ’s image, can rise. Jesus isn’t shy about claiming His kingship. He says in John 10:30, "I and the Father are one." And just as foretold in the messianic prophecy in Zechariah 9:9, Jesus rides into Jerusalem to claim His kingdom on a donkey. God's people generally didn't like horses. Horses were the engines that moved the chariots used by armies that had threatened and conquered them for generations. By contrast, donkeys were seen as noble mounts worthy for a king. 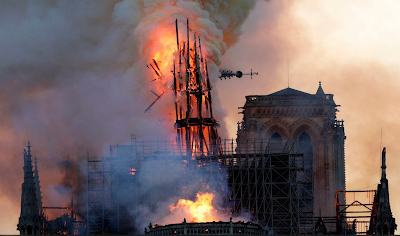 Despite the prophecy and the symbolism though, not even Jesus’ closest followers understood Jesus at this moment. We shouldn't be too hard on them. Even today, I find Jesus' ways and will difficult to understand. There have been times in my years of following Jesus when it has seemed to me that Jesus has blocked from my life the very things that I thought would bring me happiness. Only in heaven will we more fully understand Jesus and His mysterious ways. But anyone, Christian or not, who tries to understand Jesus apart from His death and resurrection or apart from His call to follow Him because He is the way to life with God, they are missing the point. 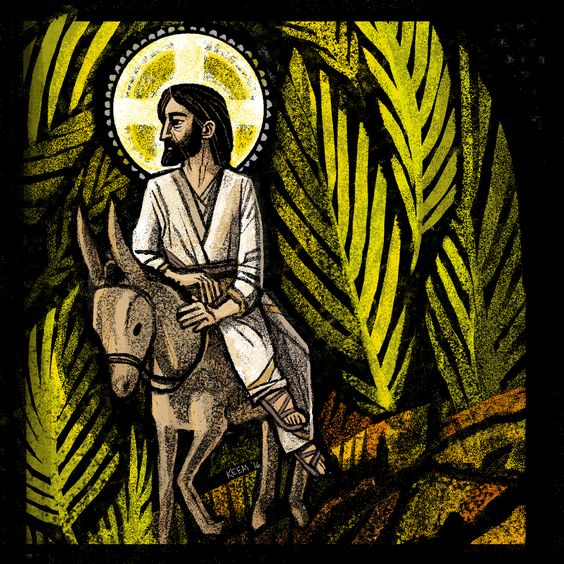 On the first Palm Sunday, some may have understood, though most didn’t, that in meeting Jesus, they were facing God in the flesh. Ignorant or not, they all disregarded His signs and the substance of His teaching, refusing Jesus’ call to follow Him through death to eternal life. Jesus raising Lazarus from the dead was seen as an interesting use of power. The crowds hailed Jesus as king because of a sign, not because of what the sign pointed to.Jesus had power; now the people hoped to draft Jesus as king to do their bidding. But within days, another Jerusalem crowd would demand Jesus’ execution. People can turn on God when they don’t like the way He does His job as Lord of the universe. A woman I knew years ago became bitter with God because, her mother, in her late eighties, died after long years of illness. “I’m mad at God for taking my mom from me,” she said. I wanted to ask the woman if she would like it if her mother, a believer now free from suffering and in the presence of God, would be brought back to this earthly life by God just to make her happy. I bit my tongue. But it’s questions like these we need to ask ourselves when God disappoints us. Jesus is seen as a threat by the Pharisees. And, in truth, Jesus is a threat to us whenever the things valued by this world--security, wealth, health, family--become more important to us than welcoming Jesus to rule over our lives. Only Jesus and not the world can bring us peace with God, the presence of God with us through all the times of this life, and life with God now and in eternity. The call of Palm Sunday is to trust in Jesus, letting Him forgive us our sins, letting Him guard us from separation from God, and letting Him give us everlasting life with God. I look forward to being with you on Maundy Thursday, Good Friday, and Easter Sunday, so that, once again, we can celebrate Jesus not as the king we want when sin has its way with us, but as the King we need when we let Him reign over us.